The Titleist 503-H combines a stainless steel head with a tungsten weight insert to create optimal trajectory for long approach shots, or tee shots. 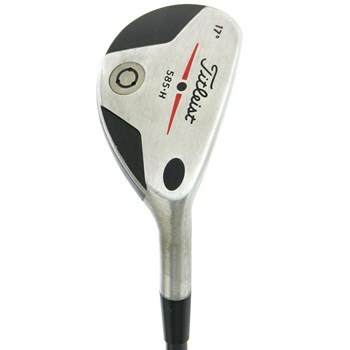 The weight is deep and low in the head, which creates a low spin-rate for more accuracy. Non-Offset Design produces the ideal ball flight with a controllable apex for accuracy and shot control. Multi-Material Construction with a softer 431 stainless steel body provides a sweet, solid feel while a large 455 stainless steel face insert creates maximum ball speed over the entire face area. Can you provide additional pictures of the club and grip - also is the shaft stiff? Thank you! Please refer to the information to the right of the picture concerning the shaft flex. Unfortunately we are not able to provide actual pictures as we ship from multiple locations and could have more than one of the same exact item. Our shipping department will pick the item on top and process the shipment. Please refer to the information on the specific listing for the item that you might be interested in. Information regarding the headcover will be listed under the Features and Specs tab. the description say 17 degree the picture is 19 degrees which is it? All photos are representative of brand and model only. Loft, length and other specs will be those listed in the description.